George Petrie (1790-1866) grew up in Dublin, where he trained as an artist. He became fascinated by Irish antiquities and travelled around the country studying ancient sites while working for the Ordnance Survey of Ireland and the Royal Irish Academy. He won awards for his publications on art and architecture, including the influential The Ecclesiastical Architecture of Ireland, Anterior to the Anglo-Norman Invasion (1845), which is also reissued in this series. 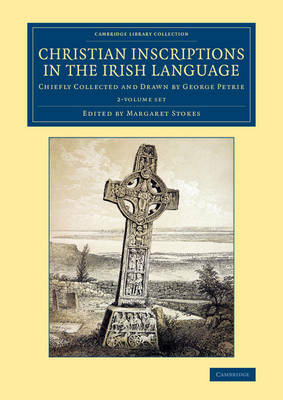 This collection of Irish-language inscriptions was edited after Petrie's death by Margaret Stokes (1832-1900), the archaeologist daughter of his friend William Stokes, and published in two volumes between 1872 and 1878. Volume 1 is devoted to inscriptions connected with the important early medieval monastery at Clonmacnoise, while Volume 2 gathers inscriptions from other sites across Ireland. Each inscription is illustrated by a drawing, and accompanied by notes on its subject, date, script, decoration and linguistic features.